Riley also said the technology made possible by having the iFiber Network will help the library stay relevant in the future. The library, located at 208 N. Main St., Mt. Carroll, has been connected to iFiber since April 2014. “I’ve noticed a lot of people sit outside and connect through the Wi-Fi we now have available thanks to the iFiber Network. We’ve always had lots of kids, but I’ve noticed more of them using the Internet now; and many patrons have mentioned how fast it is now,” she said. 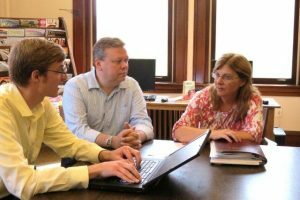 A 5-year plan to complete restoration of the library is currently underway, under the guidance of Friends of the Mount Carroll Township Public Library. The group is a nonprofit organization comprised of volunteers who support the library and its mission. “Part of the restoration plan is to have a space devoted just to technology. We want to have kiosks where people can plug in their laptops. We’d also like to include a creative lab of sorts, with eBooks, Kindles, and perhaps shared PhotoShop software. Having the high-speed broadband iFiber makes possible will be vital,” said Riley. The library plans to apply for a state grant to enable it to have a digital genealogical database for patrons to research. If granted, the Genealogy Lab could be operational within 2-3 years, she said. “We’re very pleased about being a part of iFiber, please keep it the way it is. We appreciate your Outreach Team’s guidance as we look into using other services like cloud consortiums and distance learning,” added Riley.